The Martial Arts Academy of Tang Soo Do has a long history and has had a number of names through out the years. MAATSD (Martial Arts Academy of Tang Soo Do) was originally established May of 1986 in Buford, South Carolina by Robert H Grissom. After moving to Minnesota Master Grissom and his wife Teresa opened a school in 1992 but changed the name from MAATSD to Circle Pines Karate Institute (CPKI). Master Robert Grissom was the Chief Instructor until 1999, where in he made Teresa Grissom the Chief instructor of CPKI and she remained so until 2014. In 2012 the Grissom’s changed the name to MG Karate Institute (MGKI) due to a change in location from Circle Pines, MN to Lexington, MN. CPKI / MGKI / MAATSD has been in many locations around the Lexington / Circle Pines area of Minnesota for many years. In 2014 Michael Grothe, a student of Mr. and Mrs. Master Grissom’s, became Chief instructor and owner of MG Karate Institute and In 2015 changed the name back to Martial Arts Academy of Tang Soo Do MN to pay respect and homage to the Grissom’s original school name. In 2014 Ian and Stephanie Larson, both students and former instructors of CPKI (and daughter of the Grissoms), moved to Arizona and started a sister school under regional director Master Johnny R. Williamson. Master Stephanie and Ian Larson own and run Martial Arts Academy of AZ, located in Chandler, Arizona. In 2016 Mr. Grothe started a second location in Forest Lake, MN called MAATSD MN - HERO. Currently, the MAATSD brotherhood has a total of three schools, two in Minnesota and one in Arizona. Master Robert Grissom and Master Teresa Grissom met 1978, not long after Master Robert Grissom joined Tang Soo Do under John Malloy, and was promoted to orange belt the same year. In 1981 Master Teresa started training in Tang Soo Do and Master Robert Grissom joined the Marine Corps; during leave he continued training and was promoted to red belt. In 1982 Master Robert Grissom started training under Master Daryl Khalid and was promoted to red belt 1st gup and shortly after started teaching at where he was stationed in California. In 1983 Robert and Teresa were married and in 1984 Master Robert Grissom tested and was promoted to 1st degree black belt in Arizona, and continued teaching Tang Soo Do. In 1986 the Grissoms moved to South Carolina, had their first child and established the Martial Arts Academy of Tang Soo Do. In 1987 Master Robert Grissom was promoted to 2nd degree black belt and Master Teresa Grissom was promoted to 1st Degree black belt in Region 7 under Mr. Robert Weichel. In 1989 the Grissoms moved to Minnesota and had their second daughter, and in 1990 Master Robert Grissom Tested 3rd degree black belt and Master Teresa Grissom tested to 2nd Degree black belt under Master Bob Willis. In 1992 the Grissoms opened a Tang Soo Do school, but changed the name from MAATSD to Circle Pines Karate Institute; also in 1992 the Grissoms had their third child. 1996 Master Teresa Grissom was promoted to 3rd Degree black belt under Master David J. Schmitt. 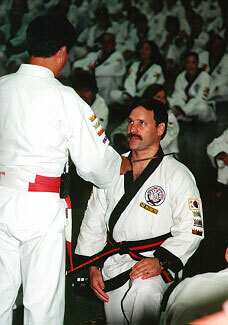 In 1994 the Grissoms had their fourth child, and in 1996 Master Robert Grissom was invited to The Masters Clinic where he was recommended to test for 4th degree Black Belt and in 1998 he was promoted to 4th degree master. In 1999 Master Teresa Grissom Became Chief instructor of CPKI (Circle Pines Karate Institute), in 2003 she was invited to The Masters Clinic and in 2006 was was promoted to the rank of 4th degree master. In 2009 Master Robert Grissom became the regional director of World Tang Soo Do Region 3 and in 2010 he was promoted to 5th degree master. In 2014 Master Teresa Grissom was promoted to 5th degree Master. In 2018 Master Robert Grissom was promoted to 6th Degree Senior Master. Senior Master and Regional Director for the World Tang Soo Do Association Region #3. Mr. Master Grissom has over 30 years of experience in the martial arts and he specializes in traditional forms and advanced instructor training with emphasis on power development through technical excellence. In addition to Tang Soo Do, Mr. Master Grissom has also trained in Hap Ki Do and wrestling. Mr. Master Grissom instills a strong sense of technical excellence in all of his students. Promoted to the rank of Master in 2006, Mrs. Master Grissom specializes in developing training programs for both children and adults that implement positive character development into traditional martial arts training. In addition to Tang Soo Do, Mrs. Master Grissom has also trained in Hap Ki Do . Mrs. Master Grissom has established an excellent youth program focused on leadership, confidence and respect that carries beyond the martial arts school and into everyday life. October 20th 2018, Stephanie and Ian Larson were promoted to 4th Degree Master in Arizona WTSDA Region 2. Mr. Stewart, Mrs. Stewart, Miss Stewart, and Mr Grothe. In 2013 Mrs. Stewart (daughter, student, and instructor of the Grissom's), was promoted to Sah Bum Nim 4th Degree Black belt.